The panel does not make the monitor. As I saw in my last 21:9 monitor review, even if you have the exact same panel in two displays, a whole lot more makes the display good or bad. One might assume that all the 21:9 displays now hitting the market are likely to be similar, or even the same, since they all use the same panel, but they would be greatly mistaken as that is but a small part of the overall display. Because of this I was looking forward to seeing what ASUS could manage to do with a high quality panel at its disposal for their MX299Q monitor. While 21:9 aspect ratios were initially designed around movies in the scope format (2.39:1 and other similar aspect ratios), they also offer a unique experience for gaming. The wider aspect enables a wider field-of-view in many games and can offer an advantage. Personally, however, for general productivity work like Word and Excel I find a 2560x1440 display to be more useful as those benefit from the vertical space. Out of the box the MX299Q has a stylish look to it. Vendors are trying to make a splash with their 21:9 panels and the styling on them has been nice so far. ASUS puts a thin silver bezel at the bottom of the display while the rest of the screen is effectively bezel-free. I’d like to see this bezel-free look come to more displays in the future. The inputs, DisplayPort, DVI, and HDMI/MHL, are located on the rear along with a headphone jack and audio line-in. Power is handled by an external power brick to accomplish the thin look. One quirk that I have with the MX299Q is the OSD. Even after I tell it to be in the lower-left corner, it always defaults back to the upper-left. If I adjust it again it moves back, but then it resets. ASUS tested this for me and it appears the early firmware on mine is the culprit as it has been fixed. The OSD has a normal amount of control available with multiple color settings, a user white point, and a pair of gamma presets. Controls are small buttons on the bottom of the panel that I find easy to confuse for each other. The small size and tight spacing make adjustments harder than they need to be, but they do get the job done. Another feature ASUS has integrated is their Smart Grid overlay. If you are working on a document and want to see how it fits into a pre-defined area, such as 4x6, you can do that. An overlay will appear on the screen and you can position it over what you are working on. Perhaps a graphics designer might find it more useful than I do as a writer and reviewer. Finally there are a pair of speakers that utilize B&Os ICEpower Class D modules. Dimensions w/ Base (WxHxD) 27.6" x 15.4" x 8.5"
I utilized the DVI input for all of my testing other than lag. 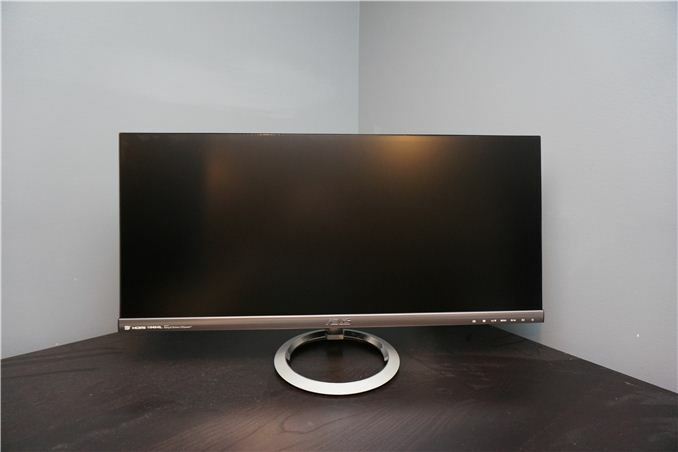 I don't understand how 1080x2560 is better for web content, but I think your main problem would be getting this monitor in that orientation to begin with, since it doesn't look like it has any VESA mounting for an arm that can lift the screen off the table that high. "They’re also fantastic for watching movies on that are shot in scope format." Blu-ray does NOT support anamorphic encoding. Believe me, I would be ecstatic if that were true! 16:9 is all we get whether the content is scope (2.35/39/40), 1.78, or 4:3, wrapped up in letterbox or pillarbox black bars. An upscale for a typical scope Blu-ray (actual content is ~1920x810) to one of these screens (2560x1080) isn't so terrible, really. That's only a 33% upscale. With a good scaler or scaler software, it should look fine... but does anyone really care about black bars so much that they would buy this screen?